When I close my eyes, and think about all the great shots I have taken over the years.. I can recall just a handful in my mind before I need to look at my own website. THIS is one of thous shots. 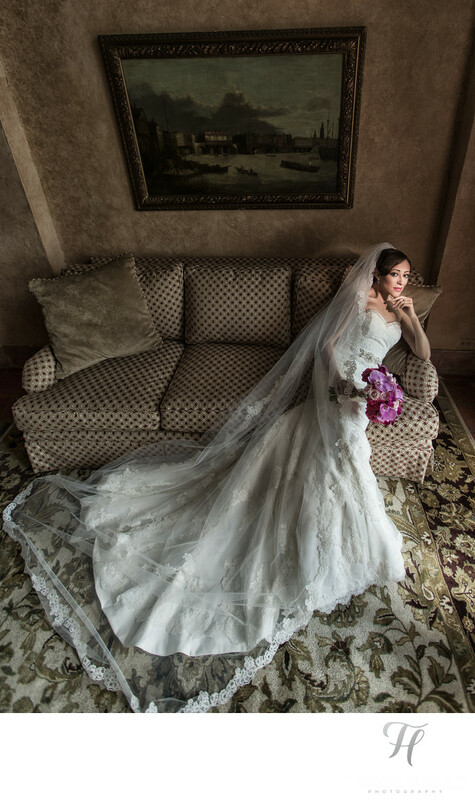 Marjorie in the “Merrick Suite” at the Biltmore Hotel on her wedding day. Let me tell you… if you want to get ready at the Biltmore, and have the resources I would encourage you to get ready in this room. It is the second best room in the entire hotel, and will offer you STUNNING images and plenty of room. Here, I am standing on the coffee table (glass I might add) to get the vantage point I wanted. My assistant is holding a very powerful static light source camera right to provide the “glamour” lighting I wanted. Great attention was given to the pose, and position of her legs to ensure a flattering shot. Sitting in a wedding dress is not easy (not that I have tried them on, LOL but you know what I mean!). I love this shot for so many reasons. The pose, the composition, Her timeless expression, the little splash of color from the flowers, and especially the lighting. The lighting here was very unique, and was tightly controlled to not "spill" all around the room and make a distracting mess. I just can't stop looking at this one.